I like cemeteries. There are names for people like me such as tombstone tourist, cemetery hunter, and graver, which are not to be confused with a taphophile who is someone who loves cemeteries and funerals. I dislike funerals. The first rural cemetery, also called a garden cemetery, was Mount Auburn (1831), near Boston, Massachusetts. The second was Mount Hope (1834) in Bangor, Maine where my sister and nephews live. Recently I took a tour of Mount Hope conducted by the Bangor Historical Society. Matt, our twenty-something guide, was enthusiastic and knowledgeable. Through the hour-and-a-half tour, he paralleled the history and early personality of Bangor with the cemetery’s inhabitants including a prostitute without a headstone, the wealthy who built the city, and Hannibal Hamlin who was Lincoln’s vice president for one term. Leaving the northeast and heading south, Evergreen Cemetery is the oldest graveyard in Fort Lauderdale, Florida where I reside. Established in 1910, like Mount Hope, a walk through Evergreen offers history lessons and a peek into the early personality of my hometown. Founding families are entombed there along with civil war veterans. Leslie Nielson, the actor from the Airplane movies, is laid to rest at Evergreen. Victims of the 1926 Great Miami hurricane are buried there. There is a section for babies, and a Jewish section. I enjoy cemeteries for what they teach but lessons in history are only a part of why I like to walk among graves. Garden cemeteries are peaceful, they’re excellent places to sit and contemplate, and are outstanding for bird watching. The older cemeteries are forces of nature with huge trees; in some cemeteries the roots of mammoth oaks and pines have grown around and through headstones and have become parts of family plots. 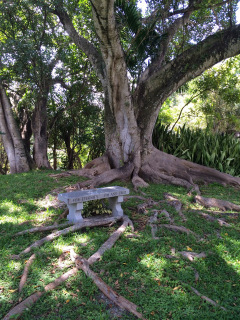 Garden cemeteries are places to walk and jog, soothing locations to think of loved ones who have passed, and temples where one can reflect upon her mortality. Most of all, cemeteries are places to feel connections with those we have never known, to read their names on headstones, their dates of births and deaths, to see who is buried next to whom, and to wonder, Who was that person? What had he accomplished during his life? What made her happy? What made him sad? My father is buried in a cemetery not far from Evergreen. It’s not as old but it’s peaceful. Visiting dad is naturally bittersweet. Bitter because I miss him, and sweet because I feel close to him when I am there. As I look around his bench and headstone, I think about the people buried near him. Dad didn’t know them in life but they are now partners in eternity. It’s the storyteller in me that spurs my affinity for cemeteries, the real stories of the entombed as well as the stories I create. When I walk through a cemetery I sense peace in the past, and I feel hope for peace in the future. 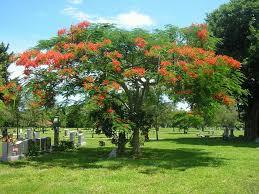 Click here to watch a video of Evergreen Cemetery.